I’m a toy collector. I enjoy spending moments tinkering with the toys in my collection and posing them in a myriad of different poses and orientations in our display cabinet from time to time. There’s this one action figure, War Machine, which I bought back in 2003. He’s this variation of Iron Man, but with cooler armor and an even cooler set of accessories. It’s got this huge chain-gun strapped to one of his shoulders, with a long round of ammo flowing down off of it. And on the other shoulder, a missile launcher, wherein you can also attach what seem to be missiles launching from the module. It’s just super cool. 5 years after buying it, I’ve got that War Machine displayed on top of my PC tower in the office. It stood there, gathering dust, yet looking cool still. I rarely fiddle with it anymore. I just enjoy knowing it’s there. My son, Daniel, probably by direct association to me, also loves toys. He’s into Transformers… big time! He sings the theme song from the cartoon whenever he feels like it. He’d raise his arms and he’d bend down to the floor while making the transforming sound-effect, and he’ll tell me that he’s now a sports car. And he’d do this whenever he feels like it, whether he’s in school, while we’re queuing up for our stored-value cards in the LRT, or when we’re at home getting ready for dinner. His favorite Transformer is Bumblebee. 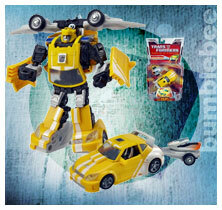 Bumblebee is this small yellow robot that turns into a small compact car in the cartoon. At night, before we retire, Daniel would include in his prayers a request to Jesus, asking if He can send him a Bumblebee toy since he has been somewhat of a good boy lately. It’s like the cutest thing to hear from a kid. So, my wife, Jenn, would scour the toy section of a mall for a Classics Bumblebee toy after doing her groceries. I did my searching online. Last month I came across a “for trade” post in a local online toy forum. And there, glaring at me in all its digital font-type glory, in the middle of all the words that flashed onto my screen, was BUMBLEBEE. The seller was willing to give up his sealed Classics Bumblebee for a Marvel Legends action figure of his choice. I immediately called up Jenn and told her about it. She called the guy and we found out that he wanted a War Machine. Marvel Legends action figures were like this; a year or two after a character has been released into the market, depending on its popularity, scarcity, and its coolness factor, the value may jump up to twice to even four times its standard retail price. Currently, the chances of seeing a War Machine in a Toy Kingdom or a Toys ‘R Us is zero. You’d probably chance up on one in those specialty toy stores in Greenhills at 200-250% it’s SRP. So, I was pondering heavily about whether I should be giving up my War Machine for a toy for Daniel. A toy that he’s been asking Jesus for. A toy that I know would make him really happy. But War Machine is just SSSO cool. He’s gut this huge chain-gun on his shoulder and a missle-launcher and a… …So, after much inner struggle, I texted Jenn and told her that she can tell the guy that we’re trading off a War Machine for his Bumblebee. So she did. That weekend, after Daniel cleaned out his plate of food like how good boys do, we told him that Jesus gave us something to give to him because he was such a good boy that week. We pulled the Bumblebee out of a plastic bag and handed it over to him. His jaw dropped as he took the toy from my hands. He looked at the packaging from top to bottom, back to front, and he ran to the room, I guess to appreciate his new toy even more in a more comfortable environment. Jenn and I were so filled with joy. Seeing the glow of excitement on Daniel’s face was priceless. We followed him into the room. And there he was, on his bed, playing with his new Transformer, the one he asked Jesus for. And up to this day, Daniel would bring his Bumblebee to school or to the car when we go out. And every moment I see him with that Bumblebee makes me remember how every molecule in that War Machine was worth trading off for. There have been so many moments in our lives that we hang on to our own desires, our past glories, our own comfort, and not realizing that God has so much better plans for us. Sometimes we just couldn’t find it in us to just let go, when it is only in letting go that we could free up our hands to embrace what greater things God has in store for our future and for our joy. So if you’ve still got that something that’s been holding you down. Or if you’re like me, who’s got that one thing you’re still asking God for that He hasn’t been granting. May you realize that He has bigger and even greater plans for you. That only He knows all your desires and what’s best for you. And that only in letting go will you be able to truly open yourself up for His greater blessings.